From The New Criterion. October 31, 2014. Here are three headlines from three different newspapers, all referring to the same press conference, held by President Obama at the White House on August 28th to explain his administration’s conduct of military operations against ISIS — or, as he insists on calling the terrorist heirs to al-Qaeda in Iraq and Syria, ISIL. Republicans, meanwhile, have criticized Obama for years as being reactive rather than proactive, often using the "leading from behind" verbiage that an anonymous White House official had the poor judgment to utter to the New Yorker’s Ryan Lizza. And as a series of overseas foreign policy crises have popped up in recent years, the White House has remained largely hands-off — a decision that rightly or wrongly feeds the narrative of it not having a real strategy. And it certainly didn’t help that the White House set a so-called "red line" of the Syrian government using chemical weapons on its people, but didn’t actually do anything when it crossed the red line. And then Obama goes and says something like he did Thursday. In other words, we need to understand that the significance of this "gaffe" is political, not strategic. The real interest is in those darn Republicans and their "verbiage" and how it has fed an embarrassing "narrative" about the President’s "hands-off" strategy that "rightly or wrongly" looks to them like no strategy at all. As to whether he is actually weak and irresolute or not, or without "a real strategy," or whether this matters, neither Mr Blake nor the Post could possibly comment. It is not a subject that appears to interest them. Very likely it doesn’t much bother the President either. Since his remark was given in answer to a question from a reporter about whether he needed congressional approval to bomb Syria, he may even have meant that the strategy he didn’t have which most concerned him — though that didn’t concern him very much either — was a political one. This could be why he concluded by saying that "there’s no point in me asking for action on the part of Congress before I know exactly what it is that is going to be required for us to get the job done." Maybe, as President Bill Clinton used disingenuously to claim, he feels that underneath his apparent weakness and irresolution, he’s really strong, and more likely to prove it (at least to his own satisfaction, which is all he cares about) by not using his strength than by using it. We were reminded of this curious conceit in the former president a few weeks ago when, in an Australian tape of an interview he gave on the eve of 9/11, he was heard congratulating himself for not killing Osama bin Laden when he had the chance because he would have had to kill some civilians as well, and that would have reduced him to the terrorists’ level. At any rate, neither president appears to know or care if the country’s enemies think him weak, or if it matters whether or not they do, or to recognize that, in diplomatic and military matters, perceptions very often are realities, and the only realities that matter. That simple truth, once understood by even the dullest political and military leaders but unknown to two such intelligent ones, and to the over-educated media which reports on them, should alert us to a serious cultural weakness that set in back in the late 1960s when Bill and Hillary Clinton were coming of political age in the anti-Vietnam war movement. It is a combination of sentimentality and self-righteousness that produces blindness to the hard realities of international power relationships and may well be more of an existential threat to their country than ISIS itself, or al-Qaeda before it. Not that these self-absorbed, postmodern presidents are unaware of the importance of perception. On the contrary, Mr Obama began his remarks to the press that day by saying, after the opening greeting, "First, beginning with the number one thing that most Americans care about, the economy. . ." He had some good news in the shape of a slight upward revision of the growth figure for the second quarter, so it was only good political sense to lead with that — and with the reminder that Americans cared more about it than any Middle Eastern strategy, or lack of it, that he might subsequently care to mention. Perception is everything when votes are at stake. When refractory foreigners are cutting off American heads, not so much. 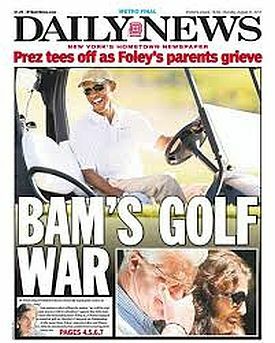 He’d shown that a week earlier when, after taking a brief break from his August vacation to make a statement of commiseration with the family of the murdered American journalist, James Foley, he immediately returned to the golf course where he was pictured in the press, laughing behind the wheel of his golf-cart. Unusually emotional, President Obama declared himself "heartbroken" by the brutal murder of an American journalist, James Foley, and vowed to "be relentless" against Islamic radicals threatening to kill another American. But as soon as the cameras went off, Mr. Obama headed to his favorite golf course on Martha’s Vineyard, where he is on vacation, seemingly able to put the savagery out of his mind. learn to wall off their feelings and compartmentalize their lives. They deal in death one moment and seek mental and physical relief the next. To make coldhearted decisions in the best interest of the country and manage the burdens of perhaps the most stressful job on the planet, current and former White House officials said, a president must guard against becoming consumed by the emotions of the situations they confront. And few presidents have been known more for cool, emotional detachment than Mr. Obama. You’ve got to wonder why they needed anonymous sources even to claim that the President’s having prioritized golf over grief was merely being cool under pressure. Did the current White House officials think they might be seen as having been too critical? Or did the former ones fear not being critical enough? Or was it just a question of what has now become no more than a bad journalistic habit, perhaps meant to suggest that such a benign interpretation of Mr Obama’s behavior was the consensus of the right-thinking people on whose behalf the Times is in the habit of speaking. The important thing for us to keep in mind, you see, is that perceptions can be misleading and emotional detachment can be a good and even a necessary thing in a leader. Otherwise, when a profession of emotion is immediately followed by behavior which "seemingly" belies it, someone might get the idea that the leader was being merely calculating and cynical. Yet the juxtaposition of his indignant denunciation of terrorists and his outing on the greens this week underscored the unintended consequences of such a remove. If Mr. Obama hoped to show America’s enemies that they cannot hijack his schedule, he also showed many of his friends in America that he disdains the politics of appearance. He long ago stopped worrying about what critics say, according to aides, and after the outcry over Wednesday’s game, he defied the critics by golfing again on Thursday, his eighth outing in 11 days on the island. His comment drew fire from critics and prompted aides to clarify that he was only talking about Syria. Josh Earnest, the White House press secretary, posted on Twitter and went on television to say Mr. Obama did, in fact, have a strategy to combat ISIS in Iraq. He said it included military action, building an inclusive government, supporting Iraq’s military and recruiting regional partners. There may also have been some lingering sensitivity about Hillary Clinton’s comment in an interview that "‘Don’t do stupid stuff’ is not an organizing principle" — though the supposed "strategy" hastily outlined above by Josh Earnest was not all that much more of one. Americans often think of their president as an all-powerful figure who can command the tides of history — and presidents have encouraged this image over the years because the perception itself can be a form of power. But as his critics have made the case that Mr. Obama’s mistakes have fueled the turmoil in places like Syria, Iraq and Ukraine, the president has increasingly argued that his power to shape these seismic forces is actually limited. "Apparently," he said in frustration the other day, "people have forgotten that America, as the most powerful country on earth, still does not control everything around the world." If the world seems troubled by all manner of calamities these days, President Obama does not want Americans to worry too much. After all, he said Friday, "The world has always been messy"; it is just more apparent because of social media. And, he added, today’s geopolitical threats are far less perilous than those of the Cold War. There too, however, he was getting in his own way, since his own defense secretary and chairman of the Joint Chiefs had shown quite a different sense of urgency a week earlier. Secretary Hagel had said that ISIS was "an imminent threat to every interest we have" that was "beyond anything we’ve seen." And General Martin Dempsey had said we could not defeat ISIS without engaging it in Syria as well as Iraq. Both claims had to be downplayed by Mr Earnest, the spin-master. Even some Democrats in Congress, notably including Senators Dianne Feinstein and Bob Menendez, were beginning to criticize the President, but the media, for the most part, could be counted on to stay loyal no matter what confusion he caused. As the headline in The Washington Post to a piece by Karen De Young and Dan Balz put it "Obama sets his own pace in a world whirling with crises." Doubtless if Lincoln had thought of it, he could have made the same excuse for his reluctant General McClellan. The General might not have been taking the fight to the enemy, but at least he was showing his coolness under pressure and his indifference to criticism by setting his own pace. Perhaps it was to demonstrate precisely that that the administration, after Mr Foley’s death, made public the story of its mission to rescue him while he had been still alive — a mission which failed because it proceeded according to the President’s too-deliberate pace. By the time the Delta Force commandos got to where he and other prisoners had been held, they were gone. Why would the administration want to publicize that? Because, I think, it expected applause for trying, or at least for something better than mere apathy. The élite media shares this "soft bigotry of low expectations," as the last President Bush used to call it, and so can hardly be expected to report on the President otherwise than fawningly. His assumptions about the world are also theirs — assumptions based on a mixture of political correctness, self-esteem based education and the kind of moral relativism which regards as "judgmental" the invocation of any standard of behavior not derived from one’s own beliefs and one’s own sense of self-satisfaction with them. To say that he "sets his own pace" is to say that there is no pace, nothing outside himself even of the most exigent circumstances which matters very much compared to his sense of his own rectitude — which is why a gossip’s claim that, before he was elected, Mr Obama had asked, "Wouldn't it be great for the world if I were president?" also slots, "rightly or wrongly" into that Republican "easy narrative." Bill Clinton was of course a product of the same culture and had a similar self-conceit — if not quite at the level of one who saw his election as "the moment when we began to provide care for the sick and good jobs to the jobless. . . the moment when the rise of the oceans began to slow and our planet began to heal." But it was quite enough for him to brag about having spared Osama bin Laden in order to show that he was the moral superior of a mere terrorist mastermind, even though he waited until he was out of office to do it. In President Clinton’s case, the cordon sanitaire the media drew around him in his first term was finally pierced by atavistic journalistic prurience in his second. Maybe sheer international fecklessness and incompetence will accomplish the same thing in President Obama’s, but I wouldn’t bet on it.